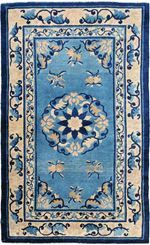 In the 18th century, weaving centers for fine art level carpets were established, embracing a historic culture with nature and its corresponding elements. 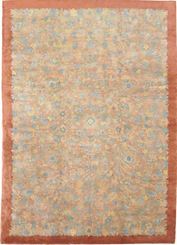 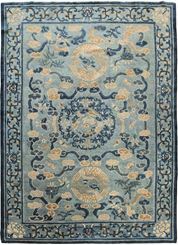 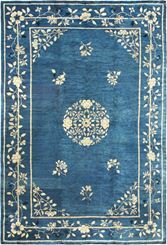 The rug and carpet renaissance of the 19th century played an important role in China, notably in the provinces of Ningxia and Peking, where manufacturing could keep up with the growing western demand. 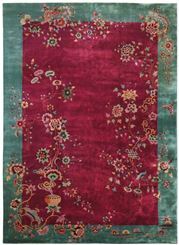 In the port city of Tientsin, in northern China, Art Deco style rugs from the early 1920’s through the late 1940’s, became highly fashionable. 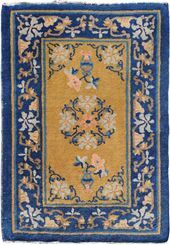 American designer and manufacturer, Walter Nichols was the most famous maker of these Deco rugs, using fine lustrous wools and unusual color combinations. 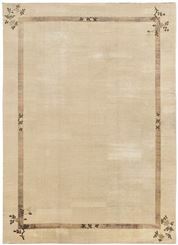 Sizes range from small to mansion. 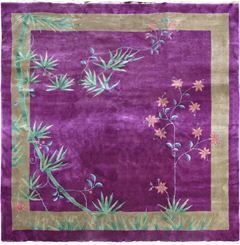 ANTIQUE CHINESE PEKING 11'0" X 15'5"
ANTIQUE CHINESE PEKING 10'2" x 15'6"
ANTIQUE CHINESE 9' 10" x 13' 8"
OLD CHINESE DECO 9' 10" x 13' 8"
OLD CHINESE DECO 9'9" x 13'3"
OLD CHINESE DECO 9'6" x 13'3"
OLD CHINESE DECO 9'1" x 11'8"
ANTIQUE CHINESE PEKING 9'1" x 11'9"
OLD CHINESE DECO 9'0" x 11'3"
OLD CHINESE 9' 0" x 9' 0"
OLD CHINESE DECO 8'10" x 11'6"
ANTIQUE CHINESE PEKING 8' 9" x 11' 6"
OLD CHINESE DECO 8'0" x 9'9"
OLD CHINESE DECO 8' 0" x 9' 6"
OLD CHINESE DECO 8' 0" x 9' 2"
ANTIQUE CHINESE PEKING 7' 3" x 9' 7"
ANTIQUE CHINESE PEKING 6' 0" x 8' 8"
ANTIQUE CHINESE PEKING 5' 0" x 6' 9"
ANTIQUE NING XIA 4' 5" x 21' 6"
ANTIQUE CHINESE PEKING 4' 2" x 6' 9"
OLD CHINESE DECO 4' 0" x 6' 7"
OLD COTTON CHINESE 3' 2" x 6' 3"
ANTIQUE CHINESE PEKING 3' 1" x 4' 10"
ANTIQUE CHINESE PEKING 3' 0" x 5' 9"
ANTIQUE CHINESE 3' 0" x 5' 9"
OLD CHINESE DECO 3'0" x 5'10"
ANTIQUE NING XIA 2' 5" x 22' 2"
OLD CHINESE 2' 4" x 4' 0"
OLD CHINESE 2' 1" x 3' 0"